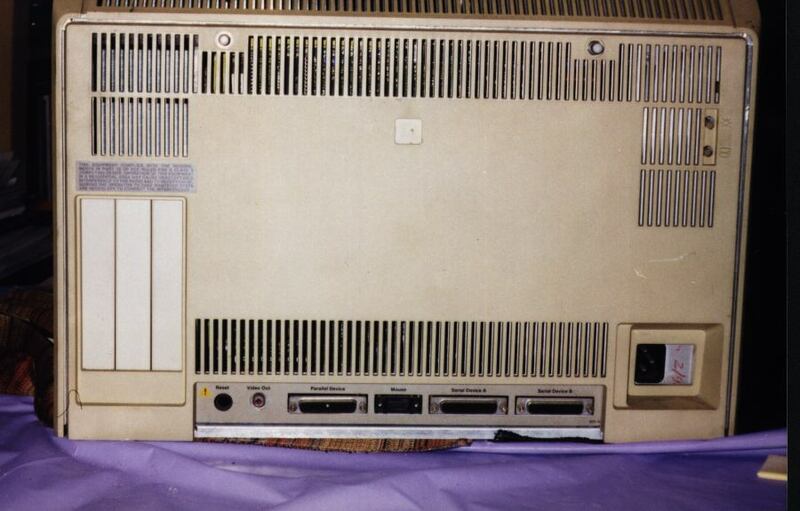 Here you are seeing the closed back view of the Lisa. The top two bolts are actually thumbscrews that lock the cover into place. On the right are the controls for brightness and contrast, under them an HP power jack. Notice that unlike the older PC's and Macs, the power switch isn't in the back where you can't reach it. To the left you can see the 3 expansion port slots, none are in use here. Also, the Lisa has extensive vent holes, this is because there are no fans inside the Lisa, making for very quiet operation (unless your HD was loud...) In all the years I've used my Lisa as a MacPlus clone, I've never had problems with it overheating. The Lisa's reset Switch. Pressing this would cold boot the Lisa. a Lisa cable.) The Profile drive would attach here. Mouse Port - this is a DB9 connector though it doesn't look exactly like one (no sheilding), and yes, you can use a Mac Plus mouse! The two serial ports (A,B) are DB25 connectors unlike the MacPlus's DB9 connectors, or the Mac's Mini-DIN 8.